On Monday morning, I awoke to the peaceful, sound of silence. Looking out in the pre-dawn hours there was not a single track in the freshly falling snow. Somehow the snow even managed to create a soft glow out of the stark light radiating from our new, highly efficient street lamps. Once a semblance of daylight made its appearance, I dressed for the weather and headed out to see how the birds of Union Bay were handling the cold. At first glance, the Canada Geese seemed impervious to the weather. After all, with a name containing the word, Canada, you would think they would be very well adapted to snow. Then again, they certainly were not exposing their long necks to any more of the cold than absolutely necessary. 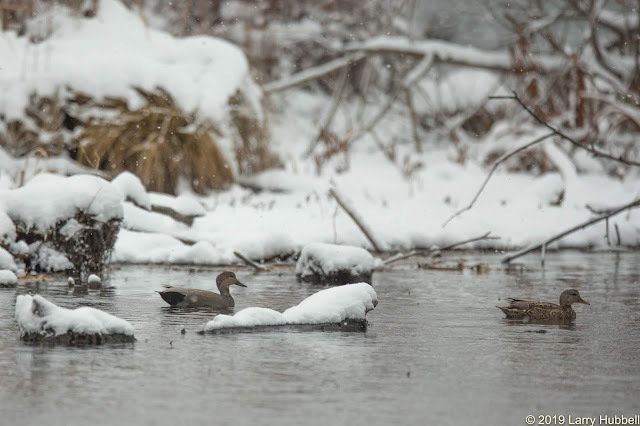 The Gadwalls were conducting business as normal - paddling about and occasionally dabbling in the shallow water - near a small island on the west side of Union Bay. On my way over Montlake Cut, I stopped by a thoughtful neighbor's bird-feeder. 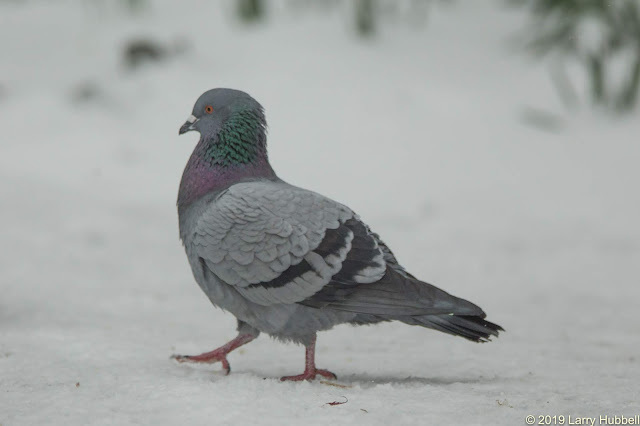 This Rock Pigeon proudly ran in circles on the ground below. He was clearly trying to chase the other birds away from 'his' food. It was kind of humorous to note that he was actually eating far less than everyone else. I am assuming he is male due to his ego-centric behavior. Honestly, I really don't have a clue how to tell the males from the females of this species. 'He' does seem rather proud of the reflective green and purple feathers surrounding his neck. Every time the dominant pigeon turned its back someone, like this Dark-eyed Junco or another Rock Pigeon, would sneak in and abscond with another beak full of grain. 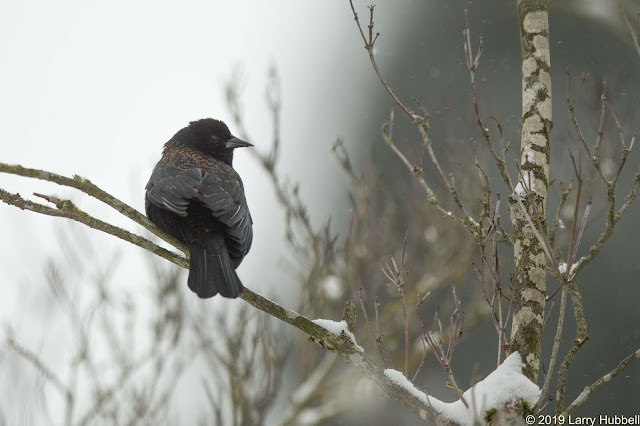 This Red-winged Blackbird sat nearby apparently waiting for a turn at the feeder. 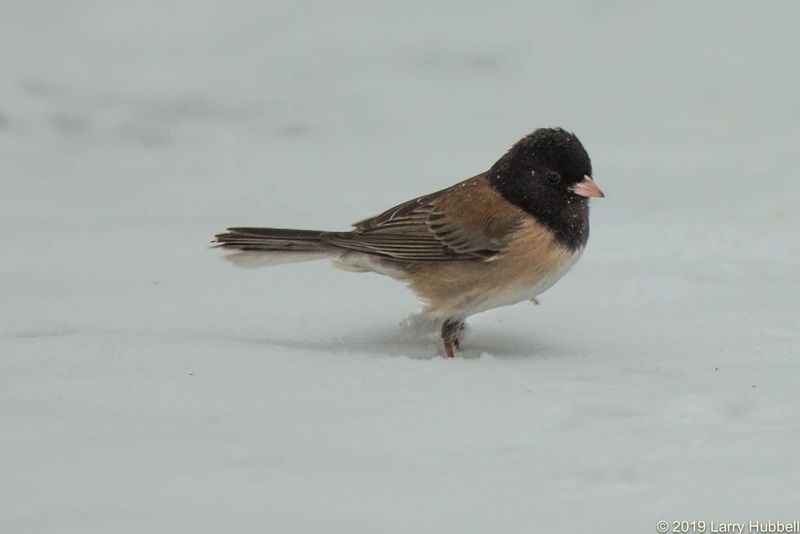 Given that he was larger than the Juncos, Chickadees and Goldfinch I really have no clue why he was waiting. Maybe he had already had his fill. He might have simply been waiting for his food to digest so he would have room to consume some more. 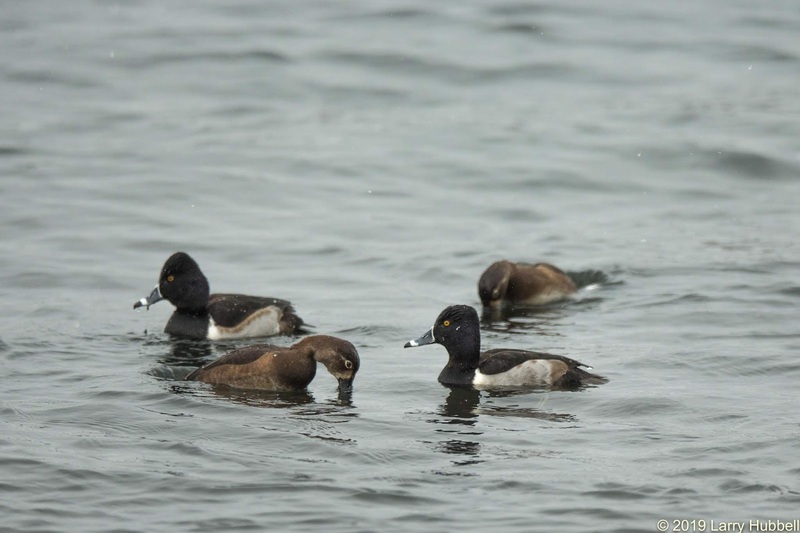 Next to Montlake Cut the Ring-necked Ducks were spending the bulk of their time underwater. 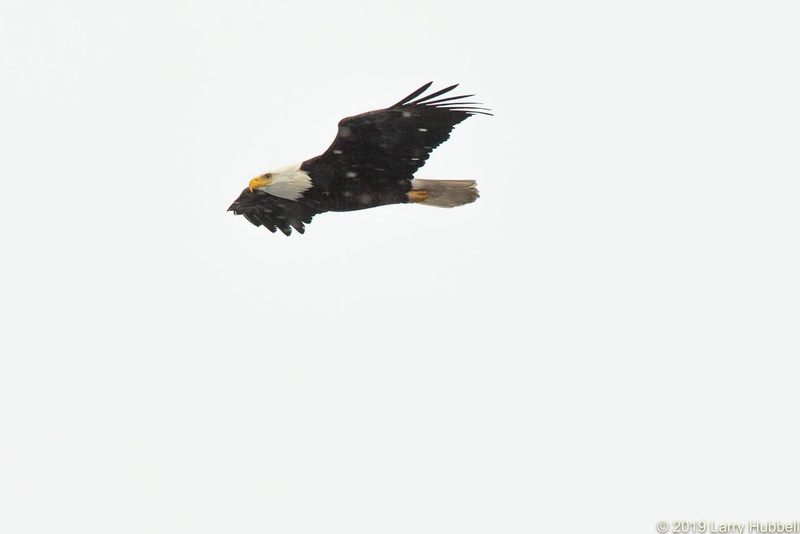 The snow was not impacting their behavior in the least. 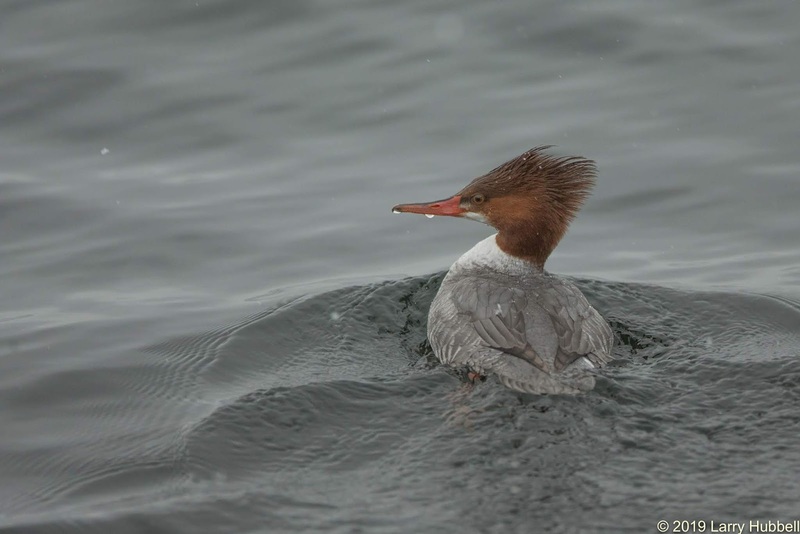 This female Common Merganser was startled by the scrunching sound of my footstep in the snow. 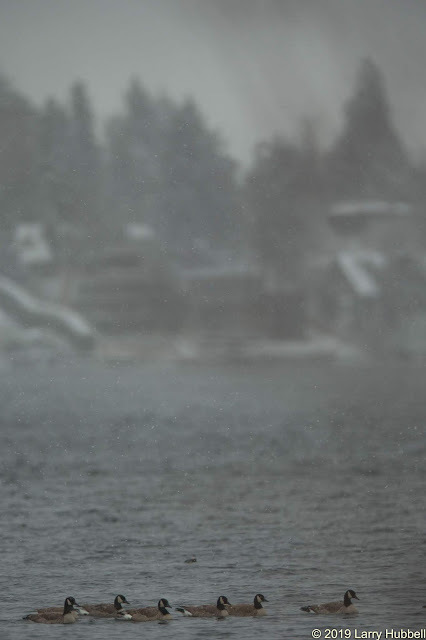 That single momentary sound appeared to be the only minor impact of the snow on her behavior. She just put her head down and went back to snorkeling, e.g. looking, for fish below the surface. 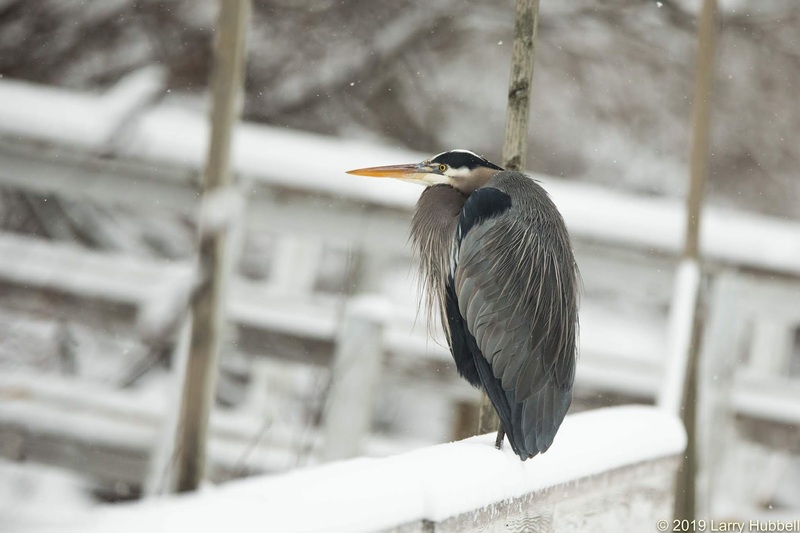 Near the Waterfront Activities Center, this Great Blue Heron was the only creature who looked out of place in the snow. The heron certainly gave the impression it was conserving every calorie possible, especially with its neck folded up tight and its head scrunched all the way down to its shoulders. Last week, I saw what I suspect was the same heron. It was out on the nearby island, next to where the Gadwalls were feeding. Maybe I am just projecting my own feelings but I have to admit that the heron in this earlier photo seems a bit happier. Its head and neck are at least a tiny bit extended and the bird appears to be soaking up a little sunshine. Sitting in the snow, on the rail of the dock does not seem like a productive hunting location, but on the other hand, maybe that heron fed earlier and was actually just burning calories and basking in the glow. However, I don't really think so. Overhead Talia and Russ kept a close eye on their southern border. 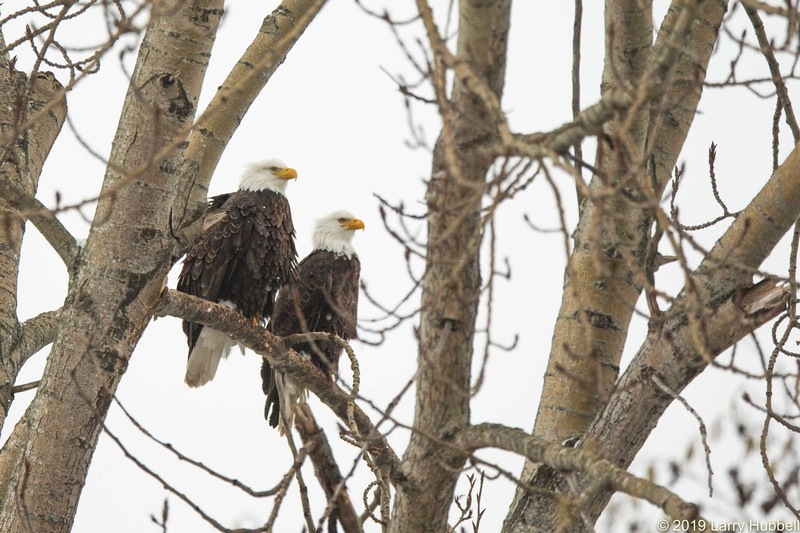 Their feathers looked a bit more ruffled than normal but other than that they seemed to be successfully ignoring the weather. 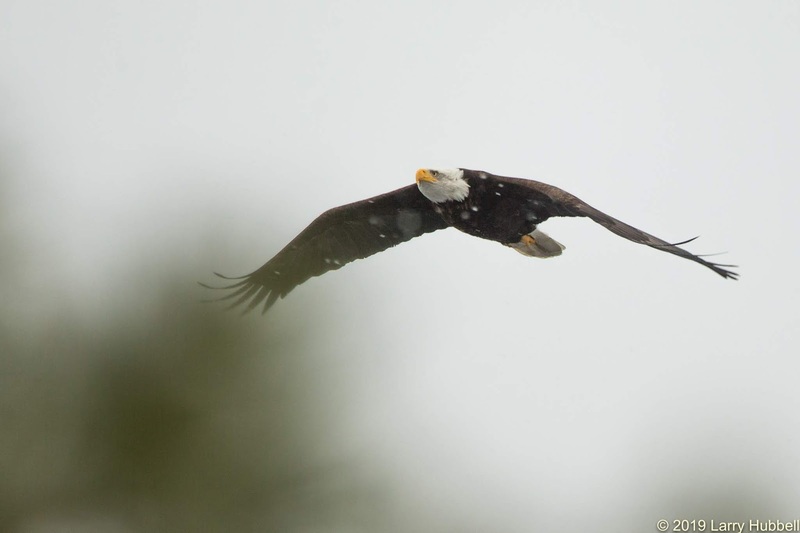 Their neighbor Marsha took a turn out over the Bay when she saw Monty, her mate, approaching. Then she returned and took up her usual post, just south of Russ and Talia, where she and Monty enforce the northern border of their territory. A few moments later Monty returned to join her. 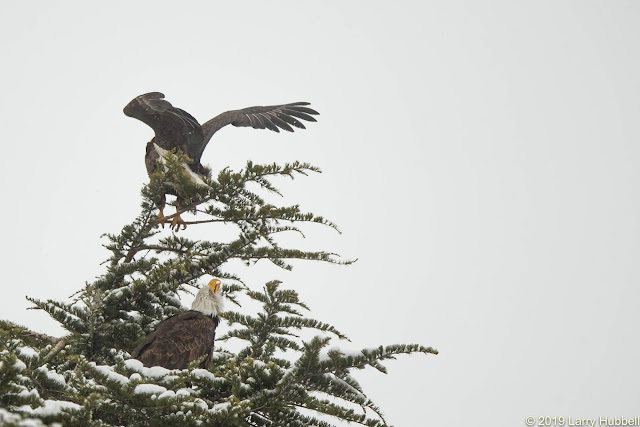 Both pairs of eagles seem to be going about their normal hunting and territorial routines. As Monty landed in the Cedar tree Marsha raised her head and welcomed him back. They both look a bit damp and a little less well-kept than normal. I suspect keeping feathers dry and properly aligned is a bit more challenging with our 32-degree snow, which is always right on the verge of melting. 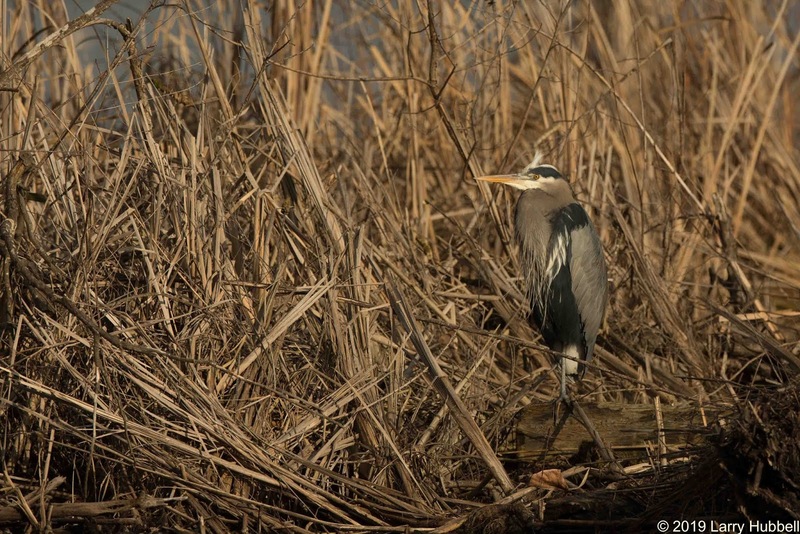 Have great day on Union Bay...where nature lives in the city! 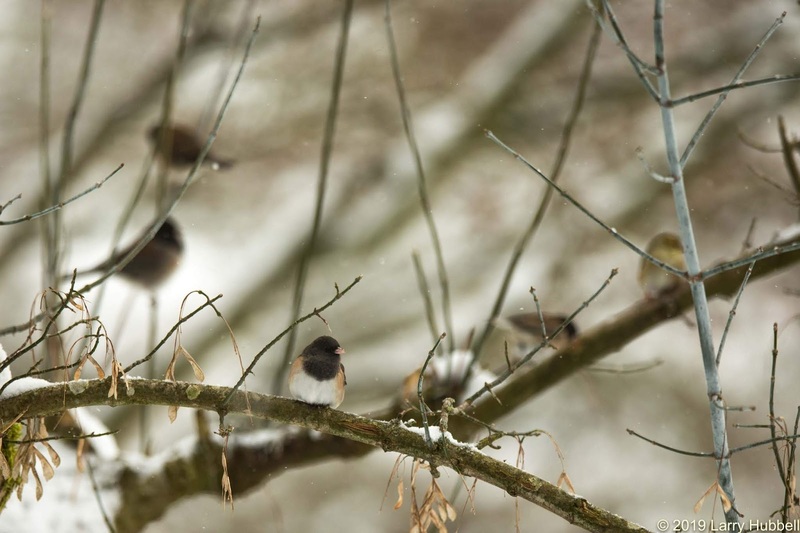 What species does the bird with the black head belong to? Is it native to Union Bay? Dark-eyed Junco: Yes, even though this is the Oregon-race of the Dark-eyed Junco, it is native to Union Bay and Western Washington.